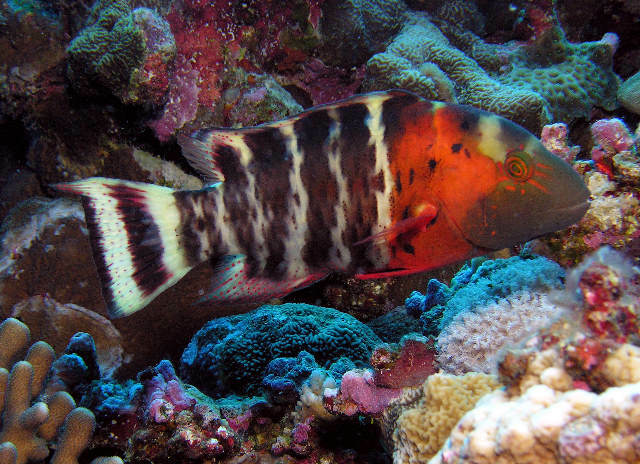 A wrasse from the Red Sea and parts of Japan, shows up in some Bali shipments, and can reach lengths of about 2 feet. Usually juveniles don’t have the red/orange colors of the adults and are very bland in color (usually brown), and because of that aren’t exported very often. Smaller ones from Bali seem to have more color and color-up faster than adults from the Red Sea, which usually don’t start showing adult colors until they reach 6-8 inches. Even though they get very large they need hiding spaces as they’re somewhat shy. They like to look in and move around the sand looking for food. Shouldn’t be kept with aggressive fish, like triggers, groupers, or eels.